Planted a tree in front yard. I knew I was in trouble when the landscaper rolled out the tree on a bob cat. I asked how much it weighed he said 300 lbs. It was more than that! backing it up to the bigger hole i dug it was a gut buster to roll it off the truck. While backing it up went over an ornimental grass hit a retaining wall stone I didn't see ripped off both left side mud flaps. But its in the hole. Welp two weeks ago i broke both front struts and i was like .... $1500 gone... didn't realize it at the time but i've been having bad stearin wheel vibrations and we thought it had broken something on my lift but nope... just knocked some weights clean off the rim or each tire... like a boss all of its fixed now and i washed it and waxed it today after bein in the shop so much she deserved it.. Washed and waxed the exterior. Put on a coat of RR. Just a note to others....check under your bed mat every so often! sunday i pulled off the factory hitch and replaced it with a Draw Tite 41930, what a HUGE difference! touched up some of the undercoating while i was under it. looking forward to mounting the 7 pin to the left of the rear tag through the bumper once this hurricane is over. 2003-V.Red 2500, 3.73s, Bilstein HDs, GM HD bumps, Monroe Str Stb, W'tech digi mats, Draw tite 41930, P3 brake controller, Volant, Gibson 65711, 2" rear spacers. 79K miles. 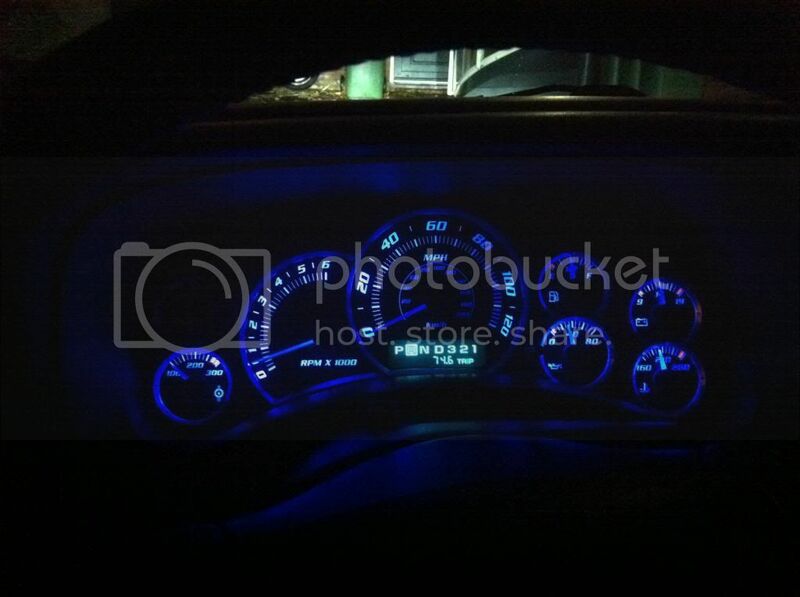 Yeah the hitches make quite a difference and yes the hurricane is slowing down a bunch of modding. Did a front end inspection today and my passenger side wheel bearing is showing some play at 179,900. Managed to squeeze it into the garage! Fixed the windshield washer fluid hose. Installed HID's in the fog lights and swapped all my regular bulbs for LED's. Avy# 1 sat in the drive. Avy #2 got driven to work by the Mrs. Avy #3 got it's winters shoes put on it. Cut another hole in it and filled it. Painted the "bowtie" on my GM mud flaps so I can put em on tomorrow! psg side window motor went out over the weekend. so i learned how to take the door panel off. alot easier then i though. changed that out. now the SES light came on for that good ole P0455 code. i changed the gas cap, cleared the code.. and it came back on today. so this weekend ill clean out the front silinoid on the engine and change out the rear 1 by the muffler. These are much brighter and it looks much better. 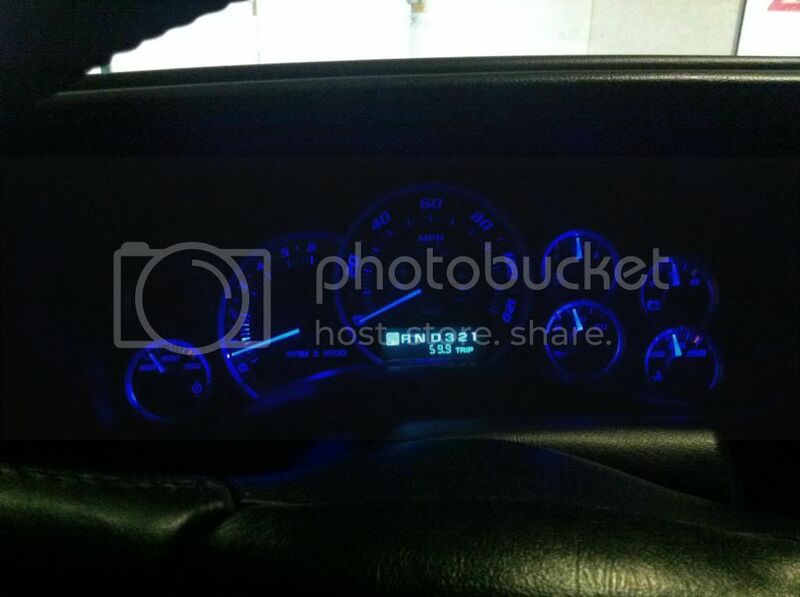 That is a sweet looking instrument cluster lighting. It might pass for the current photo contest.